Vladimir Kovalsky (left) and Dmitri Lazutkin. A new system uniting IT and medicine is taking its first steps into the Russian market. Billed as digital health, its aims are to help people save money on treatment, to accelerate medical services, and to make those services accessible to people living in the remote regions of Russia’s eleven time zones. Entrepreneurs believe this form of private medicine will boom in the Russian market in upcoming years. The partners behind the venture promising to transform Russian healthcare met in Japan. 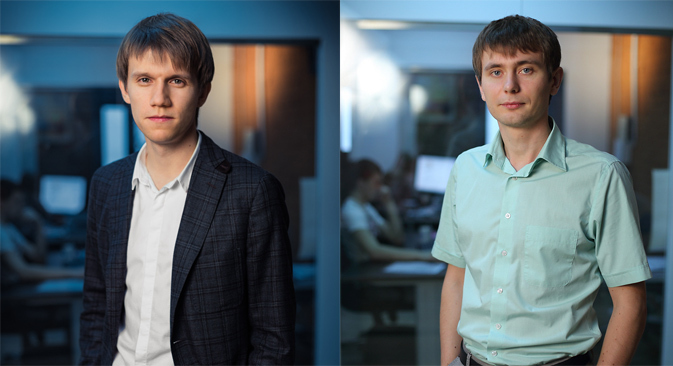 Vladimir Kovalsky, 31, and Dmitri Lazutkin, 30, both received invitations to study at the Tokyo University of Agriculture and Technology during their fifth year of school. Kovalsky was attending the Russian Far Eastern University; Lazutkin was at the Pacific Ocean State University. While in Japan, Lazutkin broke his arm. During his subsequent dealings with the local health system, including an operation, Lazutkin found himself awed by the interactions between all the players and thrilled by their result: his own rehabilitation. From his experience, a business idea was born. In 2008, together with programmers from Khabarovsk (one of the largest Russian cities in the Far East), Lazutkin and Kovalsky launched a project to gradually link up more and more clinics with a program that managed documents electronically. The name of the endeavor, which turned out to be one of the only feasible digital health projects in Russia: MEDESK. Kovalsky and Lazutkin found their calling when a nurse at a clinic in a Siberian village asked to upload a patient’s cardiogram to their system, where a cardiologist at a large medical center could study it and send back suggestions. Before, a patient in a town such as Magadan (a port town in the Far East with a population of 93,000 people located 6,400 miles from Moscow) would never have been able to connect with a high-level specialist. But MEDESK made it possible for that patient to remotely “see” a specialist in Moscow. Demand for the service exploded, bringing money pouring into both local and big-city clinics. Today, the cases that go through the MEDESK system monthly number in the many thousands. The end of 2013 saw Kovalsky and Lazutkin’s efforts pay off with the launch of a “cloud” version of MEDESK, offering even more options. The company works with clinics on a subscription basis with monthly rates ranging from the basic $50 to the premium $800. More than 1,000 doctors, administrators and economists in 21 Russian regions use the platform, which serves more than 115,000 patients and collaborators. The number of clients grows 10-15 percent each month. In the absence of external investors, MEDESK has spent $16,000 of its own $161,000 annual budget on expansion. And for now, only network clinics and big medical centers connected with at least 30 collaborators can fully utilize the platform’s potential. But Russian insurance companies are particularly interested in MEDESK, whose single system calculates the total time, work and cost needed to treat a patient. And according to Kovalsky and Lazutkin, the possibilities of digital health are as expansive as Russia itself, and must be thoroughly explored to best serve Russian patients. Originally published in Russian in Expert magazine.